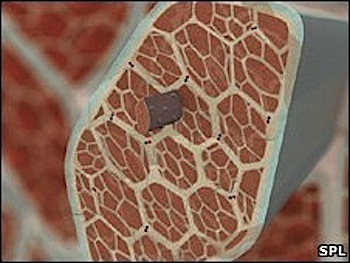 A new material has the tough, stretchy characteristics of real-life muscle tissue. This engineered polymer can imitate the properties of titin, the protein that gives muscle its elastic properties, and can be used as the scaffolding for artificial muscle creation. "A hallmark of titin-like proteins is that they unfold under a stretching force to dissipate energy and prevent damage to tissues by over-stretching," said co-author John Gosline from the University of British Columbia in Canada. "We've been able to replicate one of the more unique characteristics exhibited by muscle tissues, but not all of them." Science fiction fans have been thinking about artificial muscle since at least Larry Niven's 1968 novel A Gift from Earth. Via BBC; thanks to Winchell Chung (aka @nyrath on Twitter).